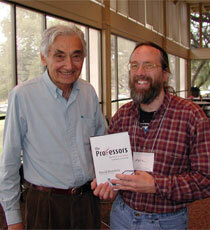 Professor Marc Becker (right) with fellow "dangerous" historian Howard Zinn (left). The promotional material on the inside flap of David Horowitz’s new book, The Professors: The 101 Most Dangerous Academics in America, presents Horowitz as a brave “academic reformer” and the book as an “exposé” – a bold stand against the “thousands of radicals who teach our young people.” Apparently “witch hunt” didn’t carry the desired tone of righteousness. Horowitz’s book primarily consists of 101 profiles of college professors, intended to be representative of the vast majority of university faculty, who are supposedly ruining the American university system. Horowitz does not attack their competence as teachers. Instead, he suggests that their ideological beliefs and political involvements make them unfit to occupy the ranks of the academy. At least that was the impression I got while paging through the book at Hastings, where it was prominently displayed directly in front of the entrance. I certainly didn’t want to financially support its existence by buying a copy. Many others have, though. In its first week of release it hung around the number 50 spot on Amazon.com’s top 100 best-sellers, and every night that week Horowitz appeared on Fox News’s Hannity and Colmes to discuss a new professor profiled. As I paged through Horowitz’s profiles, I started to realize that if all my graduate school applications hadn’t been sent off months ago, the book might have been worth a hard-earned twenty bucks. He seems to have unwittingly compiled a veritable who’s who of the most interesting, unique, and intellectually innovative (if not necessarily agreeable) academics teaching today. Among the names I recognized were Howard Zinn, Eve Kosofsky Sedgwick, Noam Chomsky, Amiri Baraka, and Gayle Rubin – any of whom I’d be thrilled to take a class with. Most surprisingly, Horowitz’s list also includes Truman professor, and frequent Monitor contributor, Marc Becker. Becker teaches Latin American history and is currently publishing findings from his ongoing research into Indian and peasant movements in twentieth-century Ecuador. What offenses did Becker commit to deserve inclusion in a list of America’s most dangerous academics? The roughly 500-word profile touches on several of Becker’s political involvements, focusing on his role as an organizer for Historians Against the War, his opposition to free trade policies in Latin America, and his protests against the celebration of Columbus Day. Horowitz doesn’t even overtly claim that Becker is wrong – his political ideas should apparently be so appalling to us that they need not be actually debated. Instead, he simply refers to Historians against the war as having an “anti-American message,” without explanation beyond that they hope to “expose ‘U.S. war crimes and government deception.’” So being opposed to war crimes now makes one anti-American? By that definition, America is a pretty self-loathing entity. Similarly, Horowitz describes Becker’s life as “filled with radicalism and antipathy towards the United States,” without documenting this antipathy in any way. Horowitz seems to equate active opposition to current U.S. policies to hatred of the United States. By Horowitz’s standard, are pro-life protesters also filled with antipathy towards America? Furthermore, almost a third of the profile is dedicated to Becker’s opposition to celebrating Columbus day. This is a debate my Catholic, suburban grade-school teachers were already encouraging us to consider. In the end, it probably doesn’t matter whether Horowitz supports his arguments or explains his choices. He’s clearly preaching to the choir. His book is aimed at a conservative base who aren’t interested in examining it’s content – people like one Amazon.com reviewer who lamented the fact that in American universities “long disproven theories like Marxism and post-modernism are able to still flourish and emit their poison into the greater culture.” These people want confirmation, not stimulation, and they’ll happily work themselves into a rage over Horowitz’s profiles, however insubstantial they are. Marc Becker was at an Historians Against the War conference this weekend, but he found the time to answer a few questions over email. What was your reaction at being included on Horowitz's list? Surprised? Angered? Honored? Stunned. I'm not worthy! I'm not worthy! (Think Wayne's World). Some friends tell me I should feel honored. I don't feel I do enough to be ranked at this level. Have you ever felt pressured (by school administration or any other forces) into toning down your political activity in order to keep your job as a professor secure? Sometimes colleagues tell me to be careful, but I've never felt any pressure from West McClain for what I do or say inside or outside of class. How do you deal with conservative students in your classes? Same way I deal with moderate, libertarian, liberal, anarchist, and others. The University is an open space for dialogue and exchange of ideas. Everyone is free to share their ideas and I try to encourage such open exchanges in a mature and respectful environment. How healthy do you think the overall state of academic freedom is in this country? Is Horowitz the exception or the rule? Horowitz is a wing nut, and picking on people like me just shows how out of touch with reality he is. We live in perhaps the most undemocratic country in the world in terms of people's engagement with the political system and a sophisticated understanding of politics. Academic freedom is like muscles in that if we don't use it, it begins to decay. We need more people who are willing to speak out against social injustice in the world. Academic freedom will be fine as long as we claim the right to political expression. Horowitz wants to intimidate people like me who oppose imperialism and neoliberal economic policies into being quiet. If we are quiet, than we have lost our academic freedom.